A Table is a stereotyped Class typically used in Data Modeling. It is represented in diagrams with a small table icon in the upper right corner. A Table element has a special Properties dialog, with settings for database type and the ability to set column information and data-related operations such as triggers and indexes. 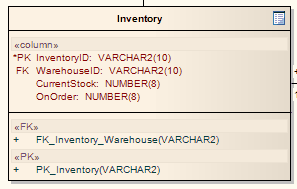 You can also define this information quickly and easily in the Database Builder. When setting up a Table, you need to set the default database type for that Table, otherwise you do not have any data types to choose from when creating columns.